I hope you can make it to our monthly chapter meeting this Wednesday. This months speaker will be chapter member Luke Rabideau, a science teacher at John Jay High School in the Wappingers Central School District. Luke will be talking about his experiences with our Trout in the Classroom program in our October meeting. For Trout in the Classroom, TU provides schools with fish tanks, filters, aerators, and finally trout eggs, and then the students raise those trout in the classroom and eventually release the young trout into approved streams. The program teaches kids about the lifecycle of trout and the importance of cleanwater. It connects kids to their surrounding environment and helps instill a conservation ethos. Here is a flyer to share. 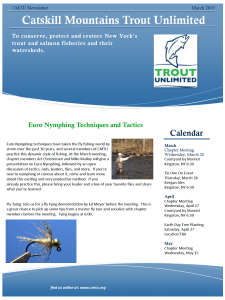 Visit http://www.troutintheclassroom.org/ for more information.